It’s thought that by 2020, millennials in the workplace will make up half of the entire workforce. As a result, it’s becoming increasingly important to attract and retain this new generation of workers. But what do millennials want most from their working life? As a generation who have grown up in an increasingly fast-paced, agile and digital economy, younger workers tend to lean towards an environment that reflects this modern approach. 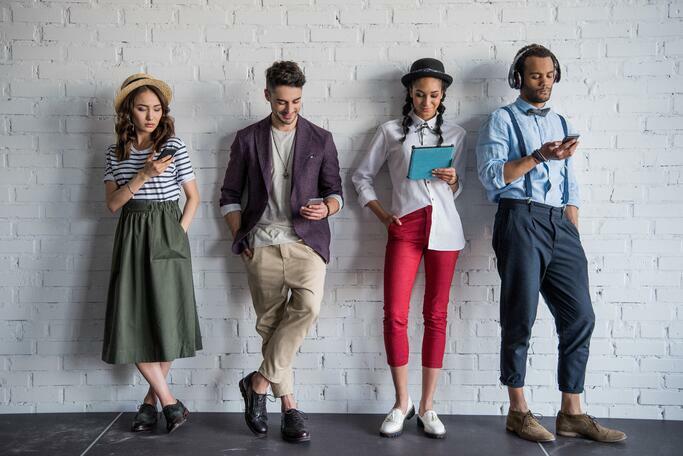 In this blog, we take a look at some of the outdated working practises that millennials avoid and the ways you can build a modern workplace to attract the best fresh talent. Understanding millennial working style can make all the difference to office productivity. Here are 3 outdated working practices that millennials actively avoid in the modern workplace. Did you know that 85 percent of millennials state they’d like to telecommute 100 percent of the time? What’s more, 75 percent of millennials believe that working remotely has a positive impact on productivity. 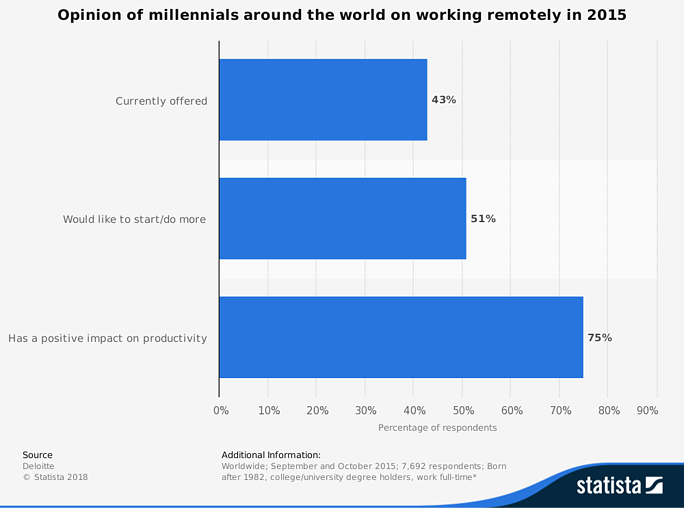 75 percent of millennials state remote working has a positive impact on productivity. The traditional 9-5 structure is undesirable for many millennials. As well as being restrictive, office environments can prove particularly distracting. 60 percent of professionals admit that loud co-workers are a major source of distraction, while 40 percent state that impromptu co-worker interactions slow their productivity. Offering flexible working policies within your business allows your team to choose where and when they work best. This means that your employees can work productively, communicate effectively and collaborate no matter where they are. The benefits of an agile workforce are widely reported. As well as giving your employees the flexibility to work around their needs, remote working has been proven to boost engagement and significantly lower stress levels. While your office might not be inscribing documents and emails on stone tablets, if your communication methods are old-fashioned, you’ll put millennials off. For instance, restricting your staff to paper-only processes can take up a lot of your employees’ valuable time. Slow or inaccessible communication methods hinder collaboration efforts and slow everything to a crawl. - Skype – which can be used for quick, effective face-to-face meetings. - Microsoft Teams – a collaborative portal where employees can instant message, call or create group chats. - Sharepoint – this is a hub for sharing information and collaborating with employees. In today’s millennial workplace, work doesn’t have to be restricted to a desk. In fact, more than half of businesses with under 1000 employees are implementing Bring Your Own Device (BYOD) policies, which are helping to boost worker productivity. 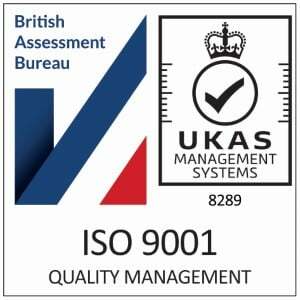 However, there are still organisations dragging their feet, unwilling to adapt to this popular modern workplace trend. But the truth of the matter is, millennials are already intuitively using their mobile devices at work. According to a Gartner survey, 45 percent of workers not permitted to use personal devices were doing so anyway. If not regulated, this kind of shadow IT can seriously damage your data security. Instead of fighting the trend, why not find out how to embrace a secure BYOD policy? 42 percent of millennials are likely to change their job each year. As a generation that’s famed for job-hopping, it’s clear that user experience and flexibility is important for keeping millennials satisfied. However, with the cost of replacing an employee amounting to more than £30,000, losing millennial in the workplace is not an option. As a result, businesses must update their device policies, working practices and applications to accommodate new, modernised attitudes to work. If you’d like to find out more about how you can reinvent your workplace with new technology and boost productivity, visit our blog for more insightful content.